What Orange County Mattress Is The Perfect Size For You? What Mattress Is The Perfect Size For You? For young people who are just striking out on their own, it might be confusing trying to figure out what size of Orange County mattress you need to buy. This is the first time you’ve ever had to make such a purchase, and it can seem a little bewildering. But don’t worry: this handy guide will let you know the ideal mattress for your living situation. Toddler or crib sizes amount to about the same thing, 28 inches in width by 52 inches in length. If you have a baby of your own who is old enough to sleep in a crib, then this is going to be the way for you to go. Some mattress stores in Orange County don’t carry this size, and if that’s the case, you might need to go to an establishment that caters specifically to baby needs. The twin is the perfect mattress for a single person sleeping in a dorm room or a teenager of average size. Twin mattresses are 38 inches by 75. If you’re partnered with someone, it’s probably going to be uncomfortable for the two of you to try and sleep on it together. The twin XL is for a taller person sleeping alone. Its dimensions are 38 inches across by 80 in length. If you find that you’ve hit an unexpected growth spurt late in your teen years or even in your early twenties, you might wish to consider the XL. A full mattress, sometimes called a double, is the next step up from a twin. It measures 54 inches across and 70 inches in length. Two average-sized people can fit on a full, or a person sleeping alone will have plenty of space. A heavier or taller person might wish to go with the next model up. That brings us to the queen, which seems luxurious if you’ve only ever slept in a twin or a double before. Hotel suites in Orange County that are made for two people usually have a queen-sized bed, which is 60 inches across and 80 inches in length. Two people can sleep on a queen with room to spare in most cases, and you can still find a spot for the family dog down by your feet. A queen is also a good choice for a couple with a newborn who is too young for their own crib yet. The king-sized bed is about as big as it gets, except for a California king. A king is 76 by 80 inches, while the California king, the biggest one on the market, is 72 inches by 84. Some bedrooms are not big enough to fit a king, at least not so additional furniture will fit in there comfortably along with it. Two adults of virtually any size will fit on a king, or a whole family can snuggle up together to watch a movie. Now you should feel more ready to do some mattress shopping, Orange County. 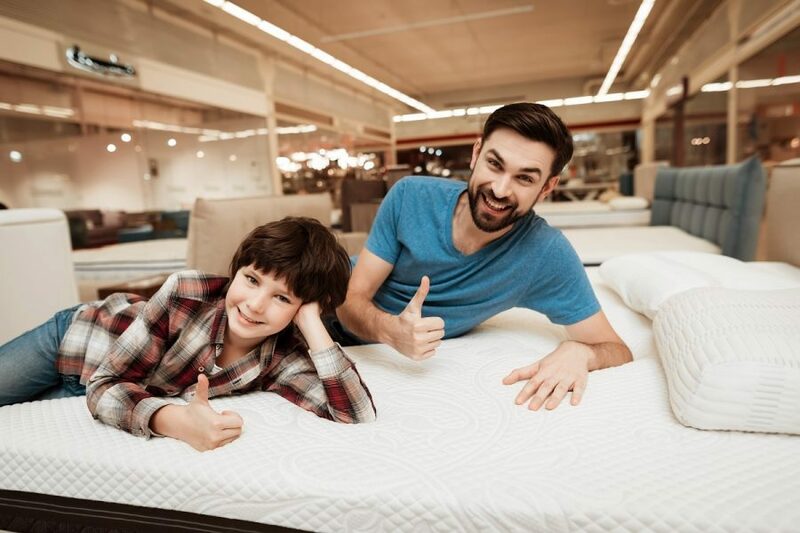 If this is your first mattress-buying experience, it’s natural to feel excited. This is a major step in your life and a milestone toward your independence.